There is a lot to love about this image. This is very early in Spokane history. so it is a fairly rare image of Spokane in its frontier stage. I love how the Indian men and women are unposed--going about their daily lives in their regular clothes, very different from the staged photographs of Indians so commonly produced by white photographers for white audiences. 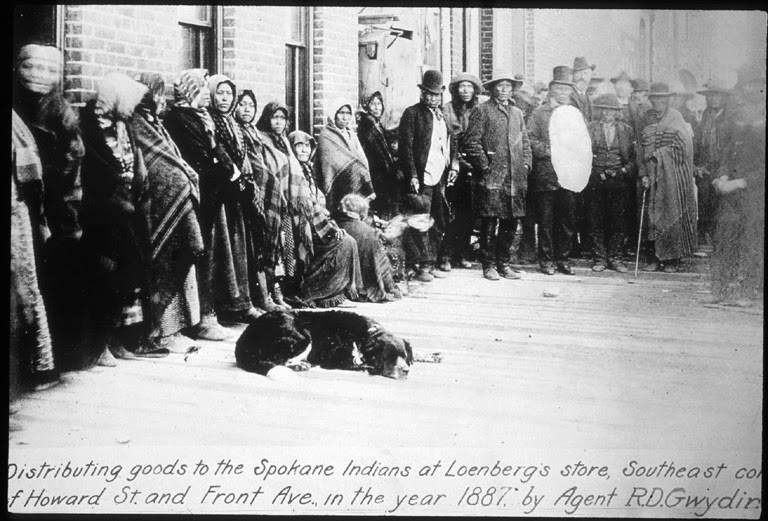 I love the questions the image provokes--When did the Indian Agents dispense rations in Spokane, and when did this stop? Are any of the individuals identifiable? Why was this photograph made in the first place? Who is R. D. Gwydir?--I have seen the name of this Indian Agent before and I think one could assemble a decent biography. (Update: Check out this brief biography at Wikipedia--what an interesting character!) And then there is the dog! The other thing I love is the simple fact that there is an exact location provided: "Lomberg's store, Southeast corner of Howard Street and Front Avenue." So often the location of historic photographs is a matter of guesswork, and my work with Spokane Historical has made me acutely aware of the value of precise locations. Front Avenue was renamed Spokane Falls Boulevard for Expo '74. Boo Radley's! A fun little local shop with funky gifts--my teenaged son loves the place, as do I. The building in the 1879 photo is long gone, of course, probably burned in the fire ten years later. I will think of that photograph every time I walk past this corner. The Salish School of Spokane is a local nonprofit dedicated to "creating a vibrant community of fluent speakers of Interior Salish languages by providing Salish language instruction to children and by empowering parents and families to speak Salish in their daily lives." I believe they have been around for just a couple of years, but they seem quite active with a variety of programs. For Martin Luther King Day, they recorded this wonderful little video of some kids reciting a portion of the "I Have a Dream" speech--in Salish! I was excited to read in Indian Country Today that the student records of the Carlisle Indian Industrial School are now online. The Carlisle school is famous, or perhaps infamous, in American history. Civil War veteran Richard Henry Pratt founded the school in 1879. 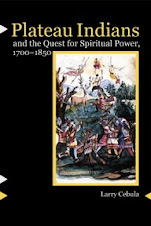 Pratt was a reformer and a do-gooder and devoted his life to what he saw as helping American Indians to survive--by forcing them to abandon their cultures and adopt white ways. "Kill the Indian in him, and save the man," Pratt once wrote, and at his boarding school Indians from all over the country were removed from their families, the boys had their hair cut, all were dressed in white clothing, and they were taught English and an industrial education. Discipline was harsh, and native languages and cultural practices were strictly forbidden. It is a sad story, not the least because nearly 200 children died at the school. 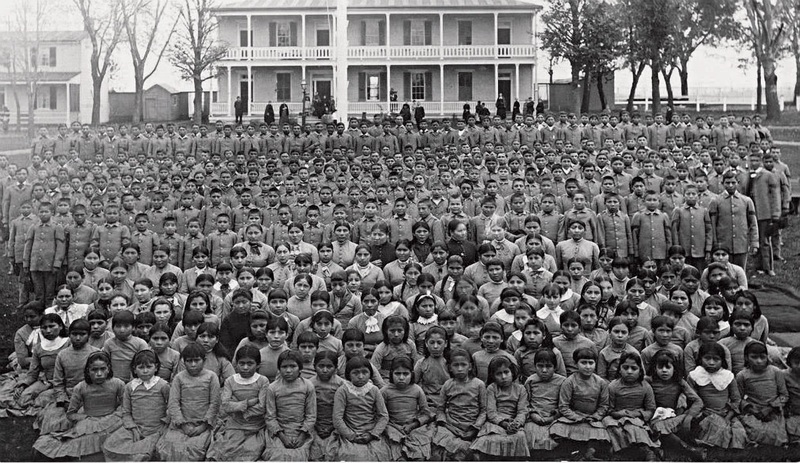 At the same time, schools like Carlisle (which became a national model for a time) brought together Indians from all over the country and provided opportunities to become acquainted, share notes, and begin pan-tribal networks that would grow into national organization such as the National Congress of American Indians. I knew anecdotally that any number of children from Columbia Plateau tribes had attended Carlisle--what would I find at the new database? I found a lot, but let me focus here on one individual, a Spokan girl named Lulu O'Hara. Lulu's file, 16 pages long, provides a glimpse into her life. The earliest document is a 1906 "Application for Enrollment in a Non-Reservation School" form. The form gives her name as "Lula" O'Hara. She was 14 year old, had attended the Fort Spokane Reservation School for six years. Her mother, Milli O'Hara, was listed as deceased. Her father was Henry O'Hara, but he appears not to have been in the picture as consent was given by Joseph La Fleur, who signed the line for "Parent, Guardian or Next-of-Kin." (At first I thought La Fleur was her stepfather, but the 1910 Indian census shows that he was her grandfather.) The form lists Lulu's "degree of Indian blood" as "one-fourth" and her tribe as Spokane. Someone has hand-written a date of 1909 across the top of the photograph, but I note that the person who uploaded the photo to Flickr (my former student Clayton Hanson actually, who was interning for LARO at the time) wrote "Given date is possibly an error." Which it certainly is, since Lulu was at Carlisle by the fall of 1906. Given the Christmas theme of the image, the best probably date is November or December of 1905. A closeup of Lulu show a poised young woman with a stylish haircut and polished shoes, looking confidently into the camera while a fellow student puts a hand on her shoulder. A sort of progress report card in the file reveals that Lulu enrolled at Carlisle on October 21, 1906, for a term of five years. Her scholarship and conduct are listed as "good" and very "good." She studied sewing and what might be "rug work." By January of 1909 the 17-year-old Lulu was sent to board with a white family, a process known as "outing." Outing was supposed to help Carlisle students learn about white society by living with respectable families, even as they earned a little money. It also reinforced the Carlisle view of the future of American Indians after they graduated, working in either manual trades or as domestic servants. Lulu was sent to serve Mrs. Harry Shallcross in Coatesville, Pennsylvania. She boarded there from May of 1907 to June of 1909. She must have returned to the house later, as she was visited at the Shallcross home a number of times in 1910 by a Carlisle field agent. He described "a pleasant home in the suburbs of town" and Mrs. Shallcross as "a kind woman, an excellent house-keeper." Lulu's wages were $6 a month and "will increase as she improves." Lulu attended school and a Catholic church, both nearby. "Lulu likes her new home very much. She is learning to cook, which pleases her." The last outing report, from May 1909, notes that Lulu's conduct is "generally good" and that her wages have increased to $7. Lulu was now 18 and had worked for the Shallcross family for two-and-a-half years. She is described as "improved very much" since she came to work for the family, though "a little sullen at times." Lulu "expects to return to Carlisle June 1 to go home," the agent noted. The last item in Lulu's folder is a January, 1912 "Record of Graduates and Returned Students" completed by Lulu herself. She was living in Creston and doing "general housework." Asked to "tell something of your present home Lulu wrote "I am living in a comfortable home with people of refinement." One wonders--what happened to Lulu after that? Carlisle taught young Indians to reject their culture and seek second-class status in white society as mechanics and domestic workers. Many, however returned to Indian Country and their families. Which was it for Lulu? tables for the children. The dishes were of white granite with a blue edge. to see. This was not pleasant, so it worked very well for punishment. The tone of the oral history and the fact that Lulu was interviewed at all shows that she did return to the Spokane tribe and was honored for her life experiences. 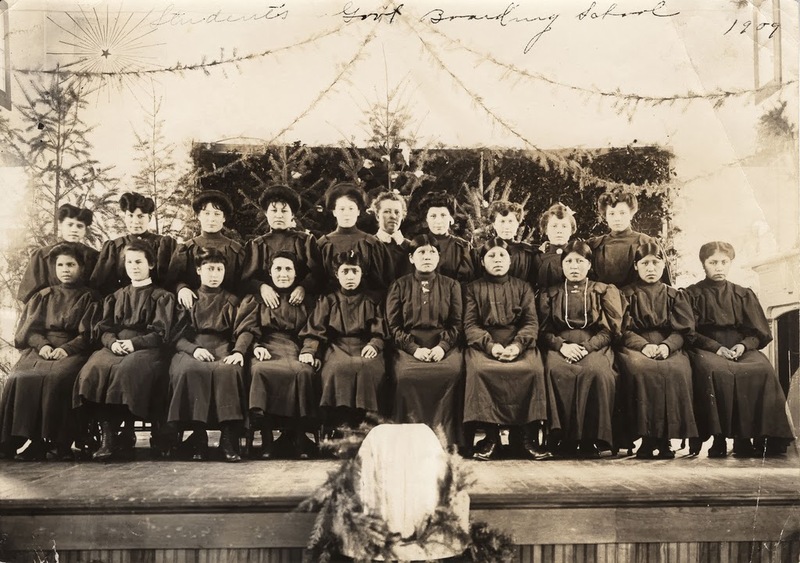 There are dozens of other files for Plateau men and women in the Carlisle Indian Industrial School archives--Colville, Spokane, Nez Perce, Flathead and more. 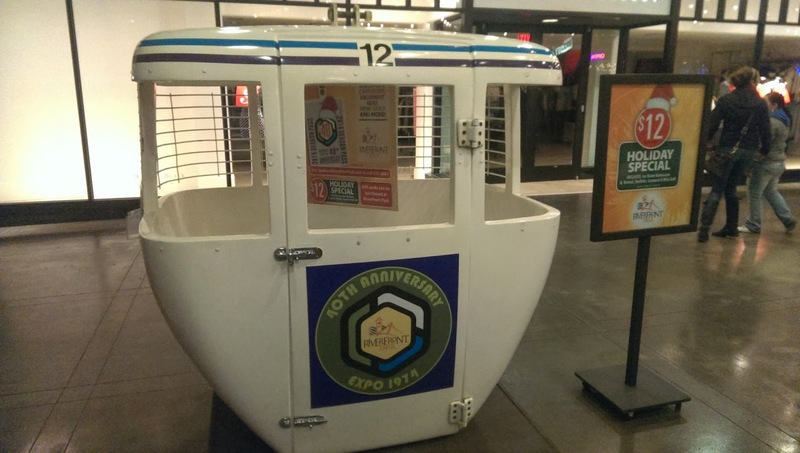 Will the 40th Anniversary of Expo 74 Pass Unnoticed? One of my favorite stories about Spokane involves a friend in Missouri and the film Smoke Signals. This wonderful movie, about two Spokane Indians on a road trip, features some scenes shot in our city. When I lived in Missouri I lent it out to a friend. Afterwards I asked what he thought. "It was pretty good," he said, "except for that one ridiculous scene. 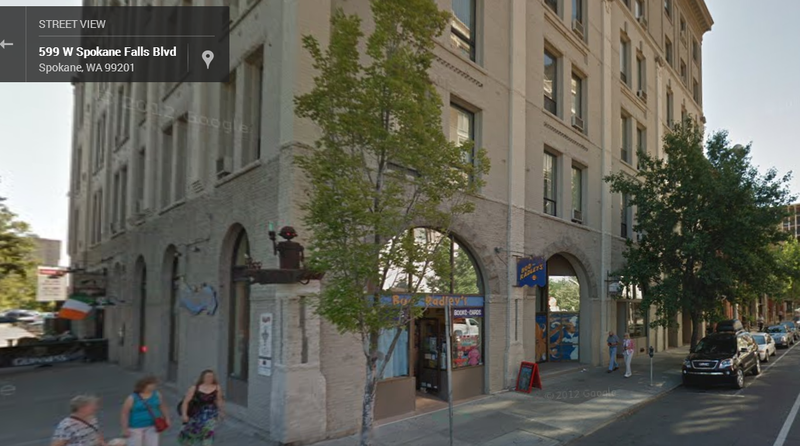 You know, the one that makes it look like there is this huge waterfall right in downtown Spokane." The falls have been there for centuries, but the ability to view them was lost for several generations of Spokanites. What brought the river back into view was arguably the most significant event to happen to Spokane in the late 20th century: Expo '74, Spokane's worlds fair. The above news report from a local station gives a nice overview of the way the fair remade the city. A polluted river, hemmed in by railroad tracks and hobos, was cleaned up and revealed. When the fair was over we were left with a magnificent urban park. It was a great victory of civic planning and visionary leadership. And it happened 40 years ago. So what are we doing to celebrate? So far as I know, nothing. Our local history museum is busy building what looks to an ambitious new exhibit, but Expo 74 is just one of their 100 stories. I am not aware of any other commemorations planned. I think it is time we got over it. Does anyone know of any commemorations or celebrations of Expo 74 that are in the works? Anyone want to put something together? 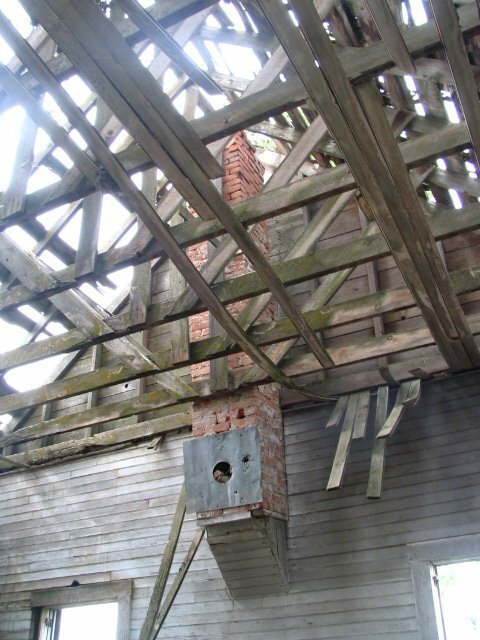 As you can see the school was pretty far gone in 2007, with massive holes in the roof and rotting floors. 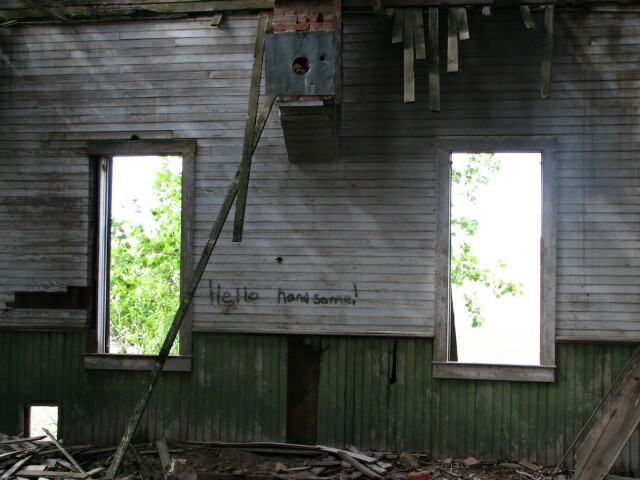 Its remote location however, tucked behind some trees off a dirt country road, had preserved it from serious vandalism. 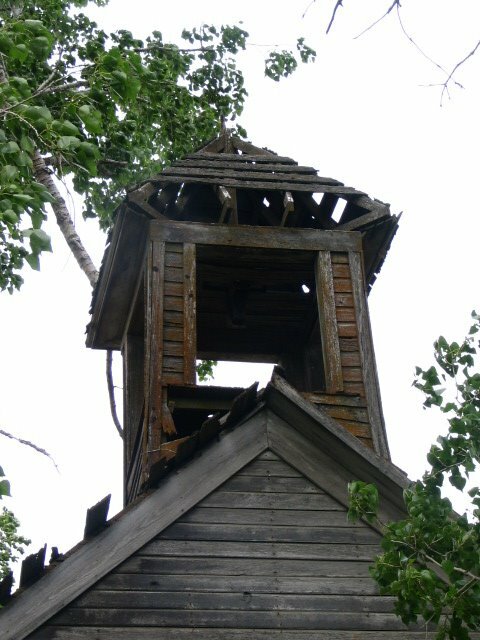 One could tell that it had been an unusually well-built school, with clapboards (rather than plaster) inside and out, a bell tower and even a stage. 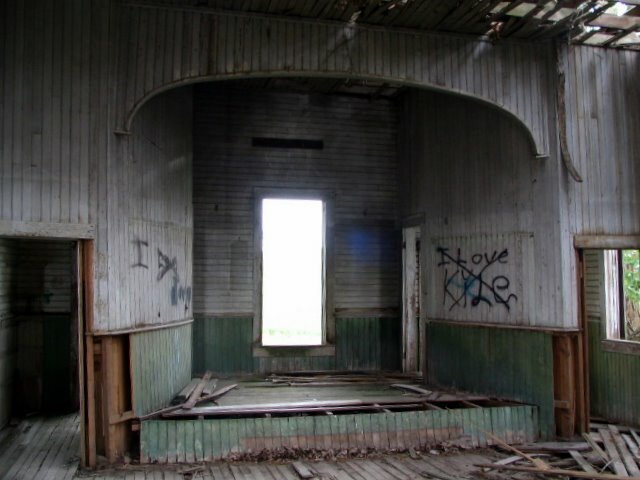 Bill and I agreed that it would take a miracle to save the place. When James finished the above map I got quite excited, and went on a number of Sunday drives with smart phone close at hand, investigating the sites of these schools. I found a lot of empty fields! 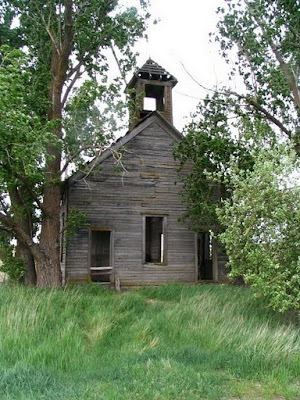 Sometimes there would be a pile of rubble or a cottonwood tree to mark where the school had stood, but mostly there was nothing at all. If someone is looking for a research project, the one-room schools of Spokane County (or maybe any other rural county) would be a good one. At the Eastern Region Branch of the Washington State Archives we have the attendance books for most of the schools on the map above, going back to the 1800s. We also have some maps, architectural drawings for a few of the schools, and even a set of job applications for the position of one-room schoolhouse teacher for Adams county around 1900. And I suspect that once you started digging, the tiny historical societies that exist in every town would have a goldmine of additional information.